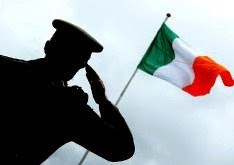 The Easter Rising of 1916 will be commemorated by a military ceremony at the GPO, O'Connell Street, Dublin on Sunday 20 April. The solemn ceremony, which will be led by the President, the Taoiseach and the Minister for Justice, Equality and Defence, will involve prayers of remembrance, a reading of the Proclamation and the laying of a wreath by the President. The ceremony will conclude with a fly-past by the Air Corps. Members of the public are invited to attend and should be in position in the public viewing area outside the General Post Office by 11:15am. Large video screens will be erected on either side of the GPO to relay the ceremony to the public.